The Home Depot Kids Workshop is a free class for kids held every month at all the Home Depot stores across the country. It's one of my favorite free activities for kids and you won't want to miss it. When a child goes to the Home Depot Kids Workshop, they'll get a free project kit they can complete during the workshop and then take home when they're finished. In addition to the free workshop and project kit, they'll also get a free kid-sized orange apron, certificate of achievement, and commemorative pin for a job well done. The Home Depot Kids Workshop takes place the first Saturday of every month, usually starting at 9:00 a.m. local time and lasting for a few hours. Your local store will have all the details on the exact time. You can drop in with your child anytime during the workshop class but make sure that they'll have enough time to complete their project before it ends. Here's the upcoming Home Depot Kids Workshop, just click on the link for more details and to register. Build a Blooming Art Piece: On Saturday, May 4, kids can build a birdhouse and take it home for free. Visit Home Depot Weekly Workshops and click on the Kids Workshops tab to view the project for the upcoming Home Depot Kids Workshop. Click the Register button and local your local Home Depot by using the Find Store button. Select the store you'd like to take your child to and choose the workshop day and time. To finish the registration, you'll need to fill out your name, email address, number of kids attending and their names and birthdays. Tip: You'll want to register for the Home Depot kids workshops to make sure your child has a spot and there are enough building materials to go around. These sometimes fill up quickly, so if you think you're child may like the class, be sure to sign up as soon as you can. The projects at the Home Depot Kids Workshop in the past have included fire trucks, birdhouses, picture frames, toolboxes, mail organizers, race cars, and planters just to name a few. The projects at the Home Depot Kids Workshop are great for both boys and girls to complete and take home. The Home Depot Kids Workshop is for children ages 5-12. An adult will need to stay with the child during the entirety of the Home Depot Kids Workshop. The project kits are only available while supplies last. 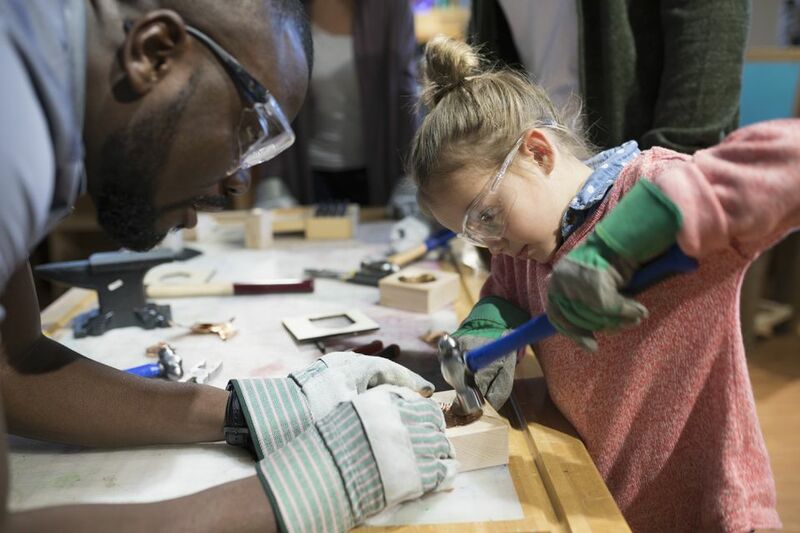 Not only do Home Depot stores offer free workshops for kids, they also have some free workshops that are for the grown-ups. Visit the Do-It-Yourself Workshops and you'll see a list of workshops available at your local Home Depot. These include a variety of workshops to learn home repair, such as installing a toilet or fixing a door lock, to project workshops, where you can learn how to build something for your home.